Dog food is the best choice when feeding dogs as a homemade meal cannot provide enough necessary nutrients. So nowadays, dog food become an essential stuff in life for a lot of people. This urges us to find dog foods that are clean and quality, as well as cost-efficient to use on a daily basis. That’s why many of us try cheap dog foods. But everyone knows that these products can’t be as good as the expensive ones, and can get into health troubles. And that’s why we have to write this guide to show all of you, the dog lovers, how to pick up the right dog food. 1 Why do we buy inexpensive dog food? 2 How to choose a quality inexpensive dog food? Why do we buy inexpensive dog food? As it’s becoming a normal household essential, dog foods are having impacts on family’s budget. Not all of us can afford such a high cost for dog foods. Everyone wants the best things for the pets, but they can exactly live well without these luxurious food bags. As long as we can provide enough energy and nutrients from clean and quality sources, we’ve fed our lovely dogs to their fullest. And inexpensive dog food is what we need. Of course, cheap dog foods cannot be as quality as high-quality ones. But they aren’t that bad. They still offer enough essential and vitamins and nutrients for pet’s growth. Their ingredients and production are certificated to be safe for dogs. They also take care for canine illnesses like arthritis or diarrhea so that you don’t need extra supplements. The only thing bad about cheap dog foods is that they contain average nutritious ingredients and allergen. But don’t worry, if you’re careful, there won’t be anything dangerous happens. As to lower the cost, manufacturers have to use ingredients such as corn, corn gluten meal or chicken by-products meal, etc. They can offer a high amount of protein but have lower biological values than meat. But it isn’t enough to prevent your pets from growing normally and healthily. Corn, appears on most cheap dog foods labels, is a controversial ingredient. The fact is that it isn’t easily digestible and can provoke allergic reactions. But there are lots of dogs eat and find no problems with corn. With a decent amount of corn, there won’t be anything too dangerous to your pets unless they’ve been already allergic to corn. So, you can feel safe about ingredients in cheap dog foods, they’re not excellent but safe and useful. How to choose a quality inexpensive dog food? Because we’re talking about cheap dog foods. Hence, you don’t need to worry about the money. The first and most important aspect now is the list of ingredients. It’s important that you analyze the food by scanning through its “Ingredients” section like when buying medicines. It’ll show what you’ll feed your pets and warn you over dangerous stuff. The most dangerous substance in dog food is preservatives. Preservatives are a substance added to food to keep it away from failing. As we all know, most of the preservatives are toxic and lethal to health. Also, artificial colors and flavors are bad for dogs. If you ever see these names on the bag, don’t buy it. Real meat provides delicious flavor and high content of protein. It’s the main source of energy and nutrients needed for a normal canine development. So all dog food products in the market tell that real meat is their #1 ingredient. But meat contains mostly water and after being processed, these water will go away, leaving a smaller content of meat than before. So, the second and third ingredients on the labels may become the first one in the final product. That means you should judge the entire list of ingredients. If there’s no other meat or high biological value items, the food you’re buying will contain only carbohydrates. Too many carbs are absolutely not good for dogs. If you’re buying top quality products, we’ll tell you to avoid corn and wheat. But you’re choosing a cheap food for dogs, so it’s hard to do that. Actually, these ingredients are the part that helps reduce your expense while maintaining a healthy meal for your pets. Instead of craving for a non-corn and non-wheat products, you should aim for products that have as least corn and wheat as possible. Comparing the content of these ingredients to the rest of the list and scan through the analysis to know whether it’s still safe to feed. Avoid ingredients that your dogs are allergic to is vital to their life. Even a small amount of allergenic can lead to many dangerous reactions from your pets. Thus, when you switch to a new dog food, feed your dogs just a little and gradually increase day by day. Do not immediately, suddenly force them to eat new things as it will interrupt digestion and body absorption. Of course, the expiry date is always important with every product. It is especially more important when it comes to food and dog food. Never use an expired product, even though it’s just 1 or 2 days over. Flavors also play a part in choosing cheap dog food. Like human, dogs have their own appetite and some are very picky. So don’t mind if your lovely puppies refuse a delicious bag you just bought. And, there is no proof to tell that this food is tasty. You can’t try it your own, right? Just let your pets decide this thing! For us, brands and fame don’t count in the field of cheap dog food. Ingredients decide whether a product is good or bad. So, after carefully analyzing and assessing, we’ve chosen 10 out of hundreds of products as the best cheap dog food. They have good quality, unique flavors and recipes, and a dedication for dogs. Purina’s Dog Chow Natural impresses us with the real farm-based chicken. Chicken is a high-quality source of protein and flavor. Farm-raised chickens are also more delicious and attractive to dogs. The food is in crunchy kibble, which is easier for dogs to chew and digest. These biscuits can also help clean dog’s teeth as when they are broken into pieces. Purina guarantees a balanced and complete nutrition supply on the food, supporting dog’s overall development. Take a look at the ingredients, there is a portion of corn, wheat, and by-products, which are controversial ingredients. But the food provides a decent amount of protein and a fat-to-protein ratio of 48%, which is reasonable for a cheap dog food. Pedigree’s complete nutrition adult dry dog food outperform other products by its diversity of flavors. It comes in 3 different taste: chicken, lamb, and steak. This can save you when you know that the food is the right choice but your dog still refuses it. Just try another flavor until your dogs completely satisfied. Aside from tremendous tastes, the product is also very healthy. Pedigree claims that the god food will help enhance dog’s immune system with vitamin E and antioxidants. Also, skin and coat will be improved to be smoother and more beautiful with Omega 6 fatty acids and zinc. Other ingredients promote better digestion, which helps your pets absorb nutrients more effectively. The content of carbs (carbohydrates) are above the average amount of other typical dog foods. Nature’s Recipe Adult Dry Dog Food does not only impress us with its quality but also its amazing diversity. The are up to 6 variations of food, each matches different types of dog. Whether your beloved is an adult, large breed or a toy breed Chihuahua, this food can always supply enough necessary nutrients and energy. Moreover, there are two different flavors for normal adults to able to serve many different dogs. For the quality, Nature’s Recipe Adult Dry Dog Food use lamb or chicken, which are advanced dietary sources of protein, as the #1 ingredient. There are also rice and barley, helpful ingredients which promote canine immune system and digestion. The most incredible thing of this food is that it contains no corn and wheat, which seems to be impossible for cheap dog foods. For large breed recipes, there are glucosamine, chondroitin for maintaining healthy joints. This can eliminate the needs for extra supplements, lower the risk of over-treating and save money. Ingredients contain no corn, wheat, that means no allergen, which raises trust in customers. As a result, much positive feedback that approves this. The only thing that we find annoying is that the size of 30 lbs is only available for adult and large breed variations. This is inconvenient for owners of smaller dogs as they must buy more to store or their products will run out faster. This dog food offers incredible bites for small dogs and only small dogs. There is no bigger size. The most popular toy dog breeds include Chihuahua, Yorkshire Terrier, Pug, Miniature pinscher, Maltese, and Toy Poodle. If your babies are among them or even other small breeds, Purina Beneful Incredibites is an amazing reward for them. The product is interesting because of its unique blend of farm-raised beef and vegetables. It uses real carrots and peas to make the taste more balanced and attractive to dogs for longer than with beef only. 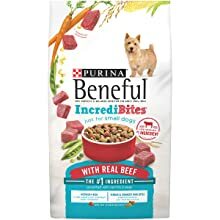 Purina Beneful Incredibites provides 23 vitamins and minerals that are essential for canine growth and health. Although there still are corn, wheat, and by-products in the food, they only count for a reasonable and safe portion. Yet another amazing dog food with no soy, no wheat, and no other fillers. 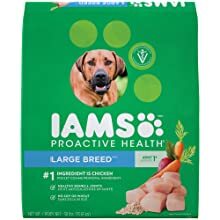 IAMS Proactive Healthy Adult Dry Dog Food uses chicken as the #1 ingredients, packed with other helpful nutrients. There are substances that promote skin and coat health. There are also substances to promote other aspects of the body, such as digestion, antibiotic or metabolism. All of these nutrients join hands to create a perfect shield for your pets, boosting their development and potential. Although there’s still whole grain corn in the food, this is the only well-known controversial ingredient and counts for a very small percentage. 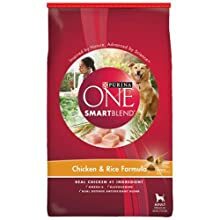 This food uses SmartBlend, a proudly and unique blend of Purina which combines chicken, grains and other ingredients. The result is a mix of higher quality and better flavor than typical cheap dog food. The food is also healthy for dogs, as their ingredients promote muscle, heart, skin and coat health. Also, joint problems aren’t problems at all since there are glucosamine and chondroitin in the Purina One SmartBlend. 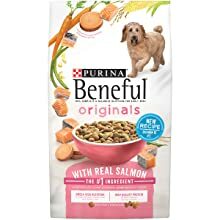 This is the mature version of Purina Beneful Incredibites and of course, used for adult dogs. The first impression is the real salmon used as the #1 ingredient. It is a very delicious food, as well as a high-quality source of protein. Additional, there are a lot of vegetables used in the products, such as potatoes, carrots, and green beans. Although they are counted as low biological value ingredients, they play important roles in providing balanced nutrition and delicious taste for dogs. Eating this food will be more interesting because of its unique texture: a mix of crunchy and tender kibbles. As human, when a dog turns old, he is more susceptible to illness, and thus require another set of nutrition. 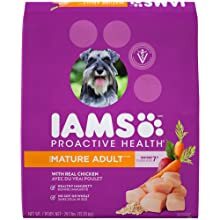 IAMS Proactive Health Senior And Mature Adult is definitely what you need for your old friends. The food provides a combination of nutrients and vitamins that help elderly dogs stand the test of time. The immune system is boosted with antioxidants and the joints are strengthened with glucosamine and chondroitin. There is also a higher content of fatty acids to revive your dog’s smooth and healthy skin and coat. With the absence of soy, wheat, artificial colors, and preservatives, the risk of getting allergic or poisoned is lowered. Having a good cheap dog food isn’t enough to guarantee you healthy dogs. How you feed them also affect their growth and health. 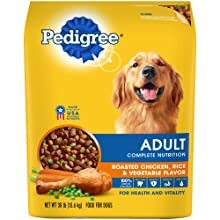 To figure out how important it is, you should look for every bag of dog food in the supermarket, and you’ll see all of them contains a section for feeding methods. They often require you to measure your pet’s weight to know the optimal amount of bites you should feed. And of course, this number will increase along with the size and growth of your dogs, demands you to keep an eye on them. This sounds annoying? No, this is what a dog lover and owner should do, as they are our children and our friends. Please read these feeding directions carefully before feeding your pets to avoid any unexpected consequences. Dogs have weaker adaptability than human do. They can’t get used to a new dog food immediately. They may refuse to eat, and if being forced to digest this strange food, they may get ill. So whenever you want to switch to another dog food, let’s start from replacing just a small portion of pet’s diet. Afterward, you can gradually increase the amount day by day and completely switch to the new product after your dogs completely get used to it. This may take around a month of so. Every dog has its own requirements for nutrition and energy. Dogs with specific conditions also need special treatments. So it’s wiser to let the vets measure what your dogs need and they will help you choose the right products. This is more significant when you’re buying cheap dog food. If I had money, I will run straight to the market and grab the luxurious Acana dog food bag. This way I won’t bother anything can harm my dogs. But if I can’t afford this ridiculous high money, I must be careful as cheap dog food aren’t much guaranteed. It can have corn, wheat, can have preservatives or other more dangerous ingredients. Without vet’s knowledge, I can’t know which is the best for my dogs. So, I definitely need to ask the vets before buying any dog food that isn’t the most expensive in the market. And so do you, for the sake of our lovely dogs. It’s hard to say which is the best food for dogs as every product has its own strengths. Also, some of them are dedicated to specific types of dogs or dog’s development stages. We have to judge many many aspects and choose the product that can be served for most dogs. 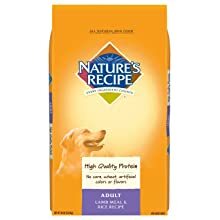 And the result is: the best cheap dog food is the product #3, NATURE’S RECIPE ADULT DRY DOG FOOD. It focuses on adult dogs, which can be served for most dogs. It also has 6 variations and 2 flavors that can match any different types of dogs. Last but not least. this food is delicious while still be very healthy with no soy and wheat. 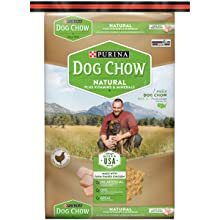 Overall, it’s an awesome cheap dog food for all dogs and dog owners. This is our very personal choice. Maybe your dogs have other nutrition needs, maybe your dogs don’t love the flavors, you don’t need to follow us. Just read each product’s review and figure out which suits your dogs, and then try it!